The Russian military took delivery of another complete S-400 regiment this week. 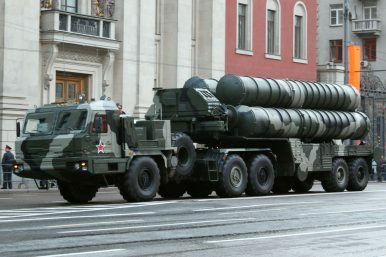 In an ongoing effort to strengthen its anti-access/area denial (A2/AD) capability, the Russian military took delivery of an additional S-400 Triumf advanced Air Defense System (NATO reporting name: SA-21 Growler) regiment ahead of schedule, according to a July 18 statement by Russian defense contractor Almaz-Antey. “Almaz-Antey Group has delivered the first regiment set of S-400 Triumf surface-to-air missile systems this year to the Defense Ministry of Russia. The official ceremony was held on the territory of the Kapustin Yar training range in the Astrakhan Region,” the statement reads. According to a Diplomat analysis, this brings the total number of deployed S-400 regiments in the Russian military to 24. Overall, this number is expected to grow to 28 regimens or 56 battalions by 2020. A S-400 regiment is divided up into two battalions (also called divisions in the Russian military), which in turn are split into two batteries. A battery can consist of up to 12 transporter erector launchers (TELs), although 4 to 8 TELs per unit are more common. In addition to the TELs, each battery includes a target acquisition and engagement (fire control) radar systems and a command post, as well as an additional fire control radar system. In comparison to its predecessor, the S-300, the S-400 air defense system features an improved radar system and updated software; it can purportedly fire four new types of surface-to-air (SAM) missiles in addition to the S-300’s 48N6E, a vertical tube launched, solid fuel, single stage SAM with an estimated range of 150 kilometers (93 miles), and the improved 48N6E2 missile with a reported range of 195 kilometers (121 miles). The S-400 is also armed with an improved variant of the 48N6E2 with an alleged range of 250 kilometers (160 miles). The air defense system can also fire two additional missiles, the 9M96E and 9M96E2 with respective ranges of 40 km (25 miles) and 120 km (75 miles). Improved S-300 air defense systems such as the S-300PMU-2 Favorite … can purportedly also fire the 9M96E and 9M96E2. The S-400s most advanced long-range missile, the 40N6, is expected to be inducted into service this month or next. With a purported operational range of 400 kilometers (248.5 miles) and a maximum altitude of up to 185 kilometers (607,000 feet), the 40N6 is thought to be capable of exo-atmospheric interception of intermediate-range ballistic missile warheads in their terminal phase. The S-400 is considered to be one of the most advanced long-range air defense systems in the world, although it is presumed less effective against low-flying terrain-hugging aircraft or cruise missiles. The Russian defense industry has reportedly delivered a new S-400 regiment to the Russian armed forces ahead of schedule.